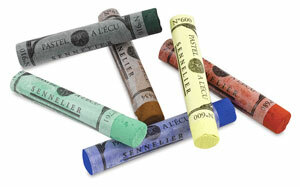 Sennelier Soft Pastels were first created way back in 1887 by Gustave Sennelier for Edgar Degas. In France, it is the only pastels that has the Kings Crown of approval on its label. They are made from 100% pure pigment that is bound with gum arabic. They do not contain any, which means these colors are more vibrant than other pastel brands on the market today. These beautiful pastels are lightfast and their colors will remain true for centuries to come. They come in both full stick and half stick size. The full sticks are air dried and individually hand wrapped. The half sticks are a little shorter and thicker than the full sticks and are not wrapped. The full stick soft pastels are available in a wide range of colors, 525 to be exact, which includes 24 iridescent colors. They are sold individually or in sets. The half sticks are available in sets that range in size from 20 to 120 different colors. Sennelier’s have a unique velvety texture and are wonderfully brilliant and intense. These pastels can be used as a paint! After applying the pastels to your paper, simply wet a brush with water and paint over the pastels. It will create a look similar to watercolors with a slight grittiness. Sennelier also makes their own paper called “La Carte” that is especially made for working with these beautiful pastels. This paper is slightly abrasive yet has a smooth and uniform texture. This unique texture enhances pigment adhesion so that less fixative is needed. So if you decide to give these pastels a try, you should consider buying the paper as well. You can conveniently purchase these items online from Blick Art Materials. See the product descriptions below for more information. I purchase my supplies online through Blick Art Materials all the time. They have amazing prices and fast shipping! Enjoy! A big thanks to Blick Art Materials for sharing this video. Check out more of their videos on YouTube here.